A consequence of the sonic potential of an amplified electric guitar, pick drag is the sound made when a guitarist slides the tip or edge of his pick along a single string. It is widely assumed that Bo Diddley introduced pick drag, in the song “Road Runner” (1957), in which the sound he made with his guitar is the aural equivalent of a car accelerating from 0 to 60 MPH. (Check out this demonstration of pick drag.) If it is true that from its inception the opposition structuring rock was groove (a redundant riff) versus sonics, then Bo Diddley is an interesting case. 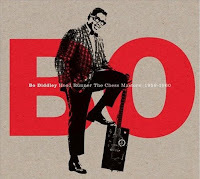 Although widely known for the “Bo Diddley beat” (“shave and a haircut, six bits”), his interest in exploring sonics — the size and shape of the imaginary spaces that hold music — is perhaps more influential. Pick drag is an example of exteriorized sound (acceleration, distance as a function of time), while Bo’s uses of reverberation, echo, and delay are examples of interiorized sound, prefiguring psychedelia. Did Bo Diddley ever record “The Pusher,” written by Hoyt Axton but famously recorded by Steppenwolf? For Steppenwolf's rendition owes much to Bo Diddley’s sonic explorations. Thanks to Stan Ridgway for the suggestion.